Vote for Me for the Best Home Cooking Blog of 2011! Ahhh! 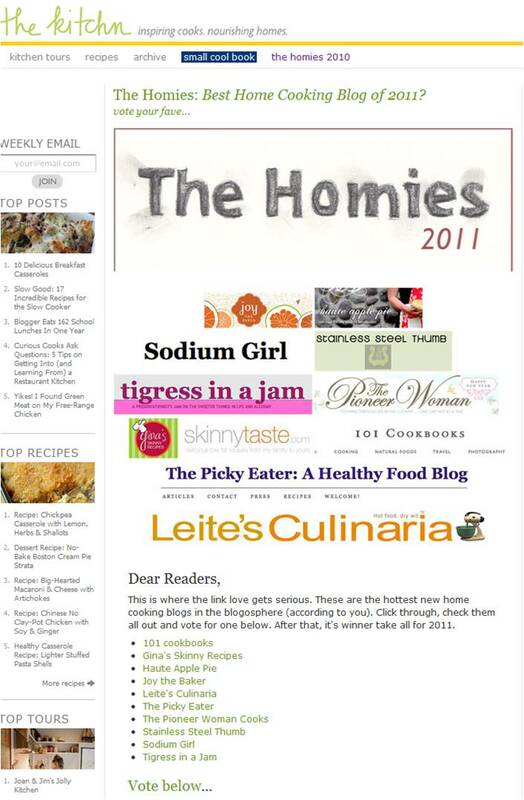 I made The Kitchn’s Top 10 Food Blogs for 2011! Vote for me if you like my blog!! Click here to vote! Note: You have to register to be able to vote, but hopefully you can use a secondary email address for that (or just don’t select any of the newsletters to avoid receiving “spam”). Winning this honor would mean the WORLD to me and I need your help to win! 😀 Thanks so much for your support!! Hi Everyone! Ok – so before I COMPLETELY sign off for 2010, I have a few exciting announcements to make! First – check out my new press page – I’m so honored and excited by the recognition my blog is receiving, and thought this would be a great place to share it with all of you! Secondly, I wanted to share a recent interview by Foomies.com – a really cool online community serving as a meeting place for food enthusiasts, where users can coordinate lunch or dinner parties with one another. I’m actually partnering with Foomies to launch my first Picky Eater Foodie Event in 2011! I’ll be sharing more details on that in the new year – but it’s tentatively planned for February 10th in SF, so mark your calendars! And Lastly, I’m partnering with Wetawa.com to hold live Q&A sessions about health and food every Friday starting January 14th 2011! So stay tuned for more details on that as well!